Just a few weeks ago we looked at the new Jaybird X4 earbuds, and the company just released another pair of earbuds called the Tarah. Not only are they also exercise earbuds that share many of the same specs, but they’re also about $30 cheaper than the X4? So, how good are they? And how do these new earbuds compare to the, also new, Jaybird X4? Both earbuds come in a nearly identical package. Fitness folks. Just like most of Jaybird’s previous products, the Tarah earbuds are aimed at anyone looking for a pair fo workout ‘buds. They have an IPX7 certification to protect against sweat as well as a six-hour battery life that should get you through most of the workout. Anyone that was looking at a pair of Jaybird X4’s. There are a few subtle differences between the Jaybird X4 and the Jaybird Tarah’s, mainly the ear tip options and battery life. Unless you really need those extra two hours of playback time there really isn’t a reason to get the X4’s over the Tarah, which is weird since the X4’s just came out a few weeks ago. How do the two compare in terms of build quality? It doesn’t make sense to talk about the new Jaybird Tarah ‘buds in a bubble. We can’t avoid comparing them to the X4, especially since their release was so close to each other. So what are the differences? Well first, there’s the general look and feel of the headphones. Where the X4 seems more sleek and modern, the Tarah come across almost whimsical. Even the charging cradle that comes with the Tarah looks more fun compared to the utilitarian design of the one that came with the Jaybird X4. Granted, it’s still a charging cradle which is annoying, but I still think it’s a step in the right direction. 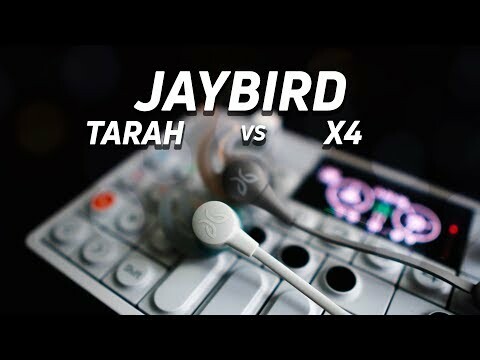 The Jaybird Tarah come with a slightly more rounded shape than the X4’s did. The control module is also slightly bigger and has a slightly more square shape to it, but I actually like it more than the X4 because it gives the buttons more real estate making them easier to find and press when you’re wearing them. Not that it was hard on the X4, but it’s definitely easier on the Tarah. The only other difference physically I can find is the shape of the earbud housings and the ear tip nozzles. The Tarah even has what was arguably the standout feature in the Jaybird X4 which was the IPX7 water-resistance rating. The Jaybird Tarah’s don’t come with a carrying case. It might be easier to discuss the Tarah in terms of what it doesn’t have. When you open the box, you won’t be greeted with the nifty carrying case that comes with the X4. Or with the memory foam earbuds or any of the other ear tips. Where the Jaybird X4 allows you to mix and match ear tips and ear wings, the Tarah come with just three hybrid tips (s, m, l). I didn’t have any issues with the fit of these, but it does mean that those with picky ears will have fewer options to play around with to find the perfect match. As far as I can tell, these are just as good as the X4. In the few days I’ve had them I only had one weird issue with playback that resolved itself as soon as I restarted the headphones, so I’m chalking it up to a random glitch. Besides that, connection is just another aspect that both Jaybird products have in common. The two control modules offer the same playback controls and more or less the same microphone quality. The playback controls also work perfectly and share the same controls as the X4 as well. The plus and minus buttons obviously control volume, but also let you skip between tracks if you hold them down. The middle down acts as a multifunction button for pausing/playing music, answering or ending phone calls, and activating Siri or the Google Assistant. Then there’s the app which is the same across all Jaybird devices. You can customize EQ settings and even find your headphones if you misplace them somewhere. The charging cradles are slightly different, but the X4 still beats out the Tarah’s in terms of battery life. This is probably the biggest difference between the Tarah and the Jaybird X4 ‘buds. Where the X4 promised around eight hours of constant playback, you’ll only get six with the Tarah. It’s not big of a deal in everyday use as I’m sure most people aren’t working out for more than six hours at a time, but you feel notice this difference over the course of a few days. Though it’s worth mentioning that both pairs offer quick charging features, so a few minutes on the charger will get you through a last minute workout. Headed to the gym? How long do you typically listen to music while exercising? If your workouts tend to last an hour (which this poll we ran on Twitter confirms), then you’ll be recharging these two or three times throughout the week compared to just once or twice for the X4. Again, it isn’t a huge deal but it’s one worth mentioning. Especially since it’s the biggest difference between the two headphones. What’s different about the songs these Jaybird ‘buds sing? The ear tip nozzles on the Tarah’s have more of an angle to them, letting them push sound down directly into your ears. When it comes to sound quality, this is just one more aspect of the two headphones that’s more or less the same. As far as I can tell, there’s no real difference in sound quality between the two, and even if there was you can still use the Jaybird app to EQ them to your preference just like the X4. It could be because of the lack of memory foam tips, but the low end does seem a little less strong here. That said, it isn’t so different from the X4 that you can’t change it just by picking a different preset. This is most noticeable in the song Submission by Gorillaz, where the thumping bass sounded lower than it did on the X4’s. If the X4’s were given a slight emphasis in the lows then the Tarah’s were given a little extra in the mids. Bass kicks don’t get in the way of vocals as much in the Tarah’s as they do in the X4’s, but the Tarah’s are also a little less clear so pick your poison. You can hear this in Generator Second^ Floor by Freelance Whales where it’s hard to differentiate between vocals and instruments at times. Again, this is me just being nitpicky because for all intents and purposes, you’ll get more or less the same experience regardless of which pair you get. The only difference worth noting was that I noticed the Tarah’s sounded louder than the X4’s. Not because they have a greater output, but because the nozzles are angled differently, and seem to shoot sound more directly down my ear-canal. Jaybird seems to know that their target audience is people who exercise, and those people tend to not want to spend upwards of $100 on a pair of earbuds for the gym. In the X4 review I stated that they were the pair to get because of the added IPX7 rating, but not even a month later that’s changed because now there really isn’t a reason to get those over the Tarah’s. The Tarah earbuds offer the same IPX7 rating, the same controls, and more or less the same sound quality. The biggest difference is the battery life which is six hours instead of eight, but I’d say that’s a worthy trade to save around $30. There are still plenty of Amazon ‘buds you can get for cheaper, but if you want to invest in a solid pair of ‘buds that will last it’s never been easy to get a pair of Jaybirds.